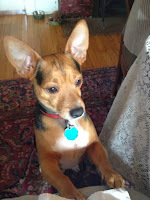 Husband Jim and I like art -- oils, water color, woodblock prints, etchings, engravings and even just prints. Art is not just for the living room or dining room with something for the bedrooms. Art should be in every room! Every room includes the kitchen -- even though the kitchen at Linderhof is functional, why should it not have pleasing things to look at on it's walls? We've never bought art because we have a bare spot but rather buy what we like and figure out a place to put it. 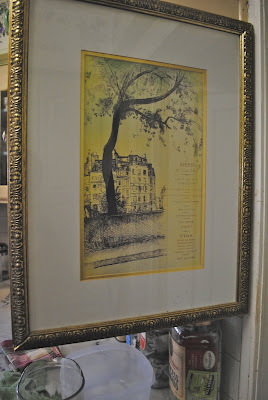 This habit has created an overflow in the attic and sometimes (but not often) we do change art out -- but mainly, we buy new and the old joins the "unwanteds" in the attic! 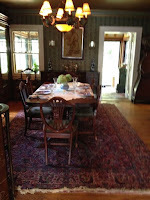 The art in the kitchen has been accumulated over the years and it isn't "kitchen art" (i.e. fruits or vegetables) per se but it does seem to feel at home there. 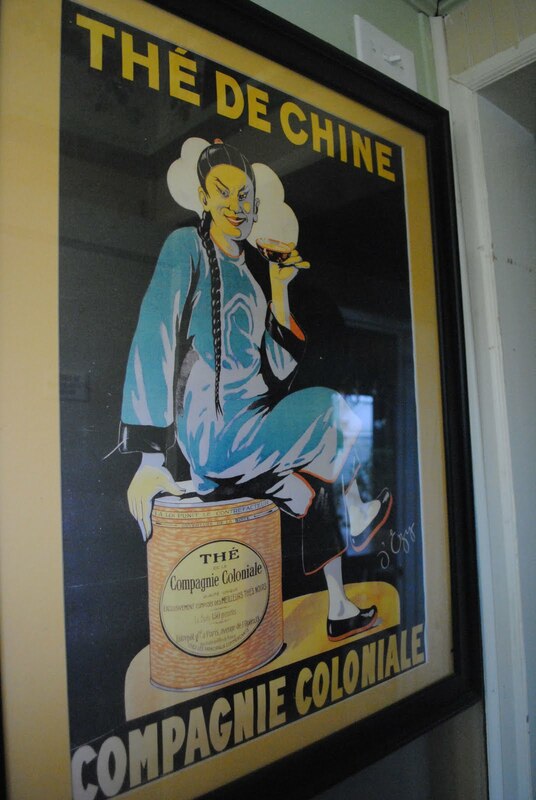 A French poster -- for China Tea! The French post fad has passed, me thinks, and although this print has some of the same components of those French posters that you saw everywhere a few years ago, it is just enough different to feel more like an original statement. Coming home, I found the poster and so I got one for Linderhof, one for Connie and Cecelia and their kitchen and a third for another dear friend who I knew would love it as much as the three of us. It's hung at Linderhof since shortly after that Homes Tour. I loved it then and I love it now! And finally, the bird prints -- they've hung in Linderhof's kitchen the longest . . . 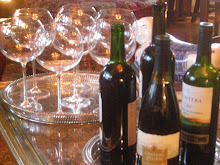 They, too, are French, bought long long ago at an antique store in Topeka where I went with friend Janelle. 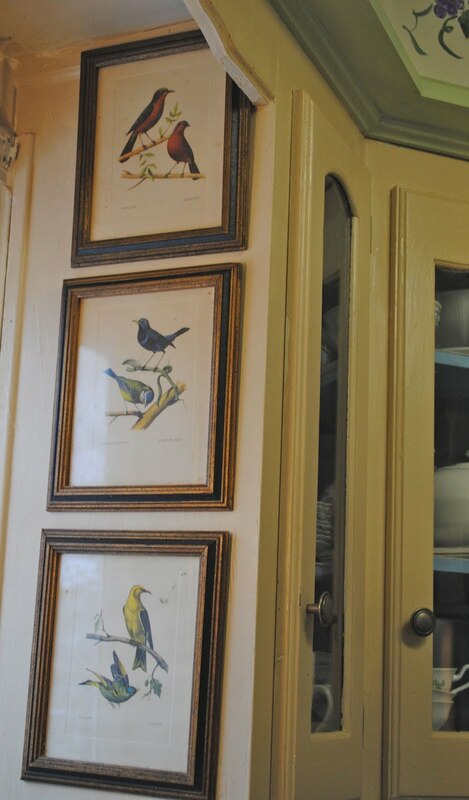 I brought them home, hung them on either side of the window of Linderhof's kitchen. Hung there, because when I bought them ages ago, there was no breakfast room and the feeders were outside this kitchen window -- the birds inside are to remind me of the birds outside. I've always loved bird prints (and there are more at Linderhof) and these are so precious to me. They were inexpensive as I recall and could not believe that they were still in the antique store -- I guess they were just waiting for me!!! And, although, I love ALL the art hanging on Linderhof's walls, these pictures hold a special place in my heart. They may not be the most favorite but they are some of the most seen because of the time I spend in the kitchen. They make me smile, every time I see them -- even though they've been hanging there for a long time. And when one is in the kitchen, one must cook. Since it's Favorite Things Saturday, I thought I would share a favorite dessert (or two)! It's not my favorite but it is Daughter Sarah's -- but, alas, she was not here to enjoy it. Her favorite dessert -- tiramisu. This week, for an event, I made the Barefoot Contessa's Rum Raisin Tiramisu. It is the best tiramisu that I've eaten -- that recipe is definitely a keeper! It is, however, rather expensive with two tubs of mascarpone and packages of ladyfingers. But it goes together quickly, can (and should) be made ahead of time and is spectacular if you want to wow someone with a dessert. Because the tiramisu calls for six egg yolks, there is an added benefit to making it . . .
For one wouldn't want to throw away six egg whites!!! 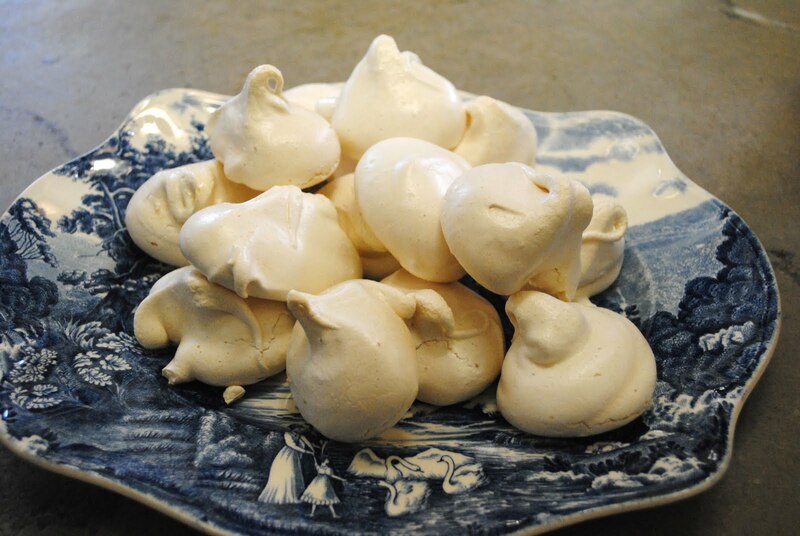 And having meringues in the pantry for tea time is a definite bonus in this snowy January! And meringues are my favorite!!! And for the tiramisu . . .
1 cup dark rum, divided, plus 2 T.
Place the raisins and 2 T. of rum in a bowl, cover with plastic wrap, and place in the microwave on high for 1 minute. Uncover and set aside to cool. Beat the egg yolks and sugar in the bowl of an electric mixer fitted with the paddle attachment on high speed for 5 minutes, until very thick and light yellow. Lower the speed to low and mix in the mascarpone until smooth. With the mixer still on low, add 1/2 cup of rum, 1/4 cup of orange juice, the vanilla, and the seeds from the vanilla bean. Stir until combined. Pour the remaining 1/2 cup of rum and remaining 1/2 cup of orange juice in a shallow bowl. Dip one side of each ladyfinger quickly in the rum mixture and place them in one layer in a 9 x 11 by 2 inch rectangular or oval dish. Break the ladyfingers in smaller pieces and dip them in the rum mixture to fill the spaces. Sprinkle half the rum-soaked raisins evenly on top. Pour half the mascarpone mixture over and spread evenly. 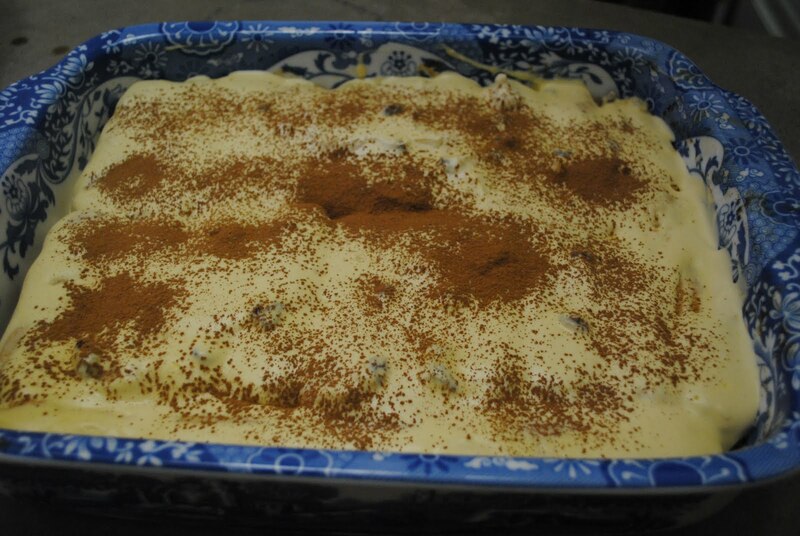 Repeat the layers of dipped ladyfingers, rum-soaked raisins and mascarpone mixture. Smooth the top, cover with plastic wrap, and refrigerate for at least 6 hours, but preferably overnight. Before serving, sprinkle the top with the shaved chocolate and serve cold. NOTE: I chose to sprinkle cocoa over the top rather than shaved chocolate. 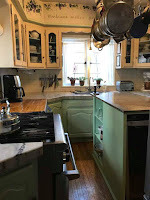 It's Saturday and for the first time, I'm joining Laurie at Bargain Hunting With Laurie for Favorite Things Saturday -- two of my favorite things -- my kitchen pictures and two wonderful desserts! I love those bird prints!! I totally understand the changing of art but I MUST tell you, my French/China tea poster is so very SPECIAL to me that I will never remove it. I abolutely LOVE that poster and probably because of the person who gifted it to me. 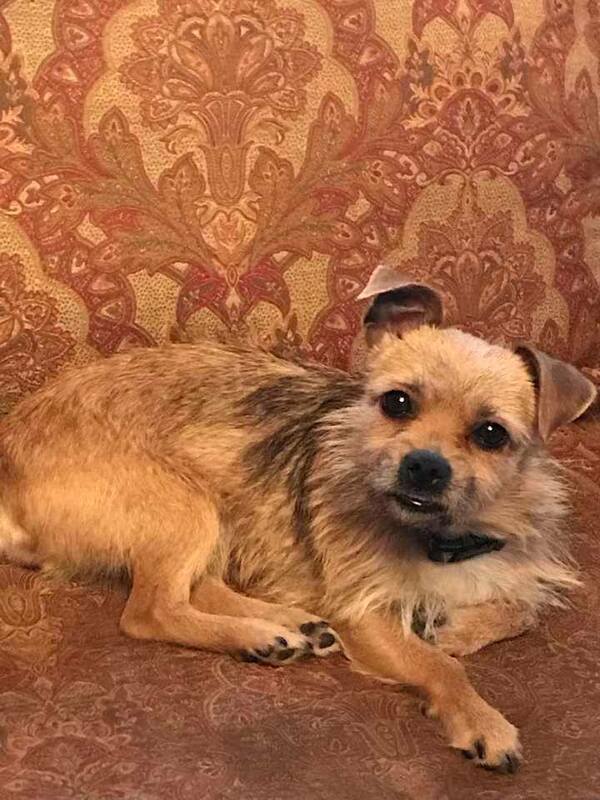 She will always be someone very special to me as well. Martha, meringues are a favourite of mine as well. Like you I have art hanging in all rooms of the house. I particularly like your tea poster and menu. 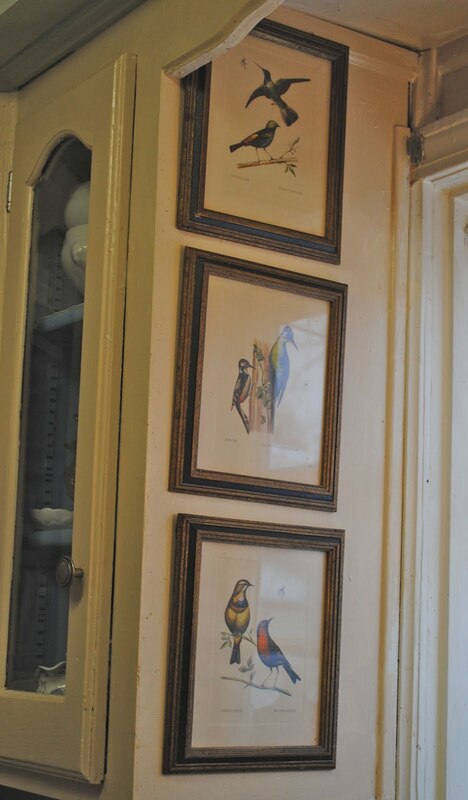 And I love the story behind your bird prints. your prints are beautiful...love the french menu! Why did I think Tiramisu had coffee in it? I've got to try this!!! I LOVE your kitchen art. The bird prints are my favorite! Gorgeous. I may be hunting up that poster for the Bistro. I've never met an Ina Garten recipe I didn't like. Except maybe her mini meatloaves..................Happy Saturday!!! 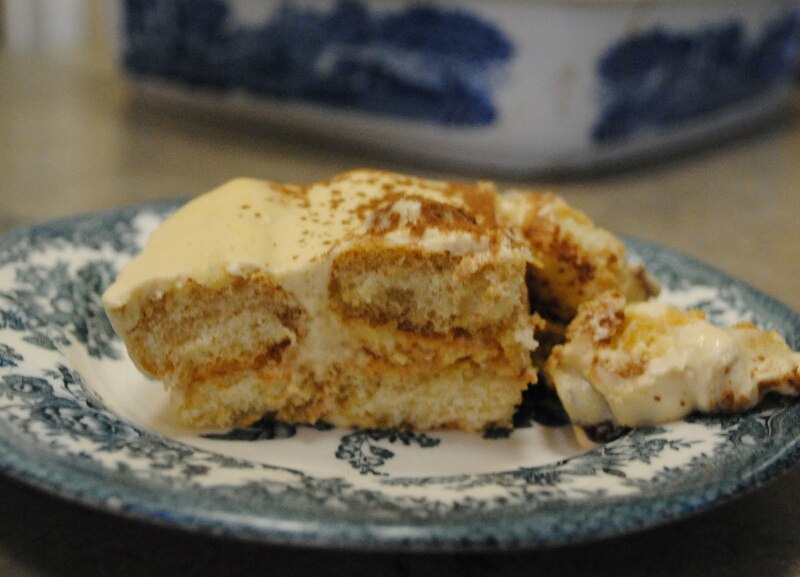 Thanks for sharing your art--and your tiramisu sounds delicious! Yes, indeed--art and kitchens go well together! You've chosen a nicely appropriate collection that is both beautiful and meaningful. I'd sure love to join you for dessert! Great kitchen art...for your spectacular kitchen! I'll say it again, I DO love your kitchen! For the six egg whites I added 1 1/2 cups sugar -- I usually use cream of tartar but didn't have any so I didn't use any. Then I added a pinch of salt and about 1/2 t. of vanilla. I just dropped from tablespoons onto a silpat and baked them like I do big meringues -- 200 for 2 hours and then turn the oven off and let them sit -- I think about 3 hours. Martha, have you considered giving tours? This is wonderful! I'm with you when it comes to art....one rune out of wall space before getting tired ot it. It seems like there's always another something wonderful waiting to be had.